I am thinking of buying the new iPad mini 3. I have never bought any Apple product before, so the only impression of Apple I have is that they make beautiful products that are locked down and have tons of restrictions. Can someone tell me if I can play videos on the new tablet directly or if not, is there any neat iPad mini 3 video converter to help with this? Days ago Apple unveiled its new iPad series iPad mini 3 alongside with the iPad Air 2. While the difference between the iPad mini 3 and the iPad Air 2 is stark, iPad mini 3 is still better than functions other tablets like Android has to offer at the same size. Yet users may be disappointed by the features which are largely similar to its predecessor, the same camera, the same screen, the same processor, the same everything, it still features highlights that attract Apple fans. For example, the 7.9-inch Retina screen is paired with a 1,536 x 2,048 resolution, same with that of iPad Air 2 but crunched down as the pixels getting closer together, which offers very distinct output images and makes it a even more ideal device to play videos. Here we bring an easy solution to convert videos to iPad mini 3 with a reliable video converter. 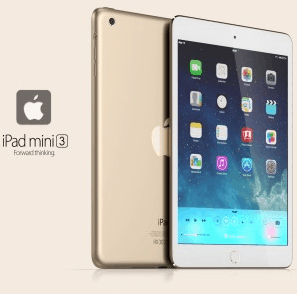 Convert Any HD/SD Videos to iPad Mini 3 at Fastest Speed! MacX Video Converter Pro - The fastest video converter here: easy to convert videos to iPad mini 3 (iPad mini 4/iPad Pro/Air 2 and more) in 4K UHD/HD 1080P/720P/SD quality with the world's No.1 fast speed! To know how to convert videos to iPad mini 3, you had better first of all have at least some idea of supported video formats. Here we list the best iPad mini 3 video and audio settings below. Best Video Converter for iPad Mini 3 - The Fastest Speed! The above iPad mini 3 video formats are obviously not sufficient to cover all the videos as they exist in hundreds of different formats like MKV, AVI, MTS etc and various codecs turn that number into the thousands. Feel confused? 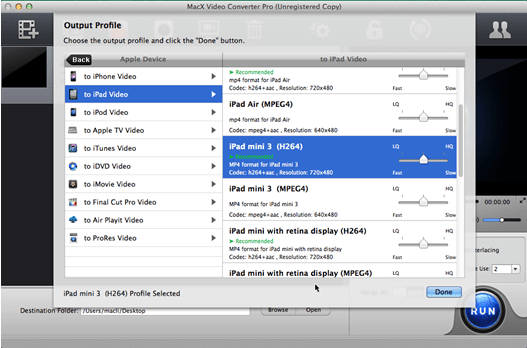 Don't worry, there is a professional video converter named MacX Video Converter Pro, which is specially designed to convert WMV, FLV, VOB, MTS, MPEG, AVI to iPad mini 3 and many more. With this powerful iPad video converting software, all the videos and movies downloaded from the Internet, shot with digital cameras, camcorders, cell phones, tablets, and output from screen recording program, video editing software etc can be easily converted to iPad mini 3 supported formats with no quality loss. Note that the tool provides the fastest video conversion speed, up to 5x faster than other tools available, for that it takes full advantage of Intel's qsv hardware acceleration tech. Before enter into the step-by-step guide on converting videos to iPad mini 3, ensure you have downloaded the video converter on you computer. You can get the Mac (El Capitan) or Windows (Windows 10) version as you need. Step 1: Launch the software and then click "Add Files" to load the video you want to convert. Step 2: Choose the output format from the drop-down list, like MP4, MOV, or M4V. Or you can just go to "to iPad Mini 3" directly. Note: You can actually convert videos to almost all the other popular devices, like iPhone 6/6 Plus, iPad Air 2, iPad Mini 3, Apple TV 3, iTunes, iMovies, HTC Desire 816, Samsung Galaxy S5 mini/S5, Google new Nexus 6, etc. Step 4: Click "RUN" button to start converting FLV, AVI, MKV videos to iPad mini 3. For your reference: Other than converting videos to iPad iPhone, it can in fact serve for more purposes, which allows you the freedom to download and convert videos to iPad mini 3 from YouTube, Vevo, Dailymotion, Facebook and 300 more sites for enjoyment offline on the go.